“Attention all passengers, a food demo is now taking off at Departure Gate 2 while the tapas is flying off the plates in the Arrivals Hall”….. Welcome to Ireland’s first food festival in an actual airport. It’s the current home of the Air Corps Rescue 118 service and a string of take-offs and landings by private pilots and air schools. Now Sligo Airport is set for a culinary take-off. 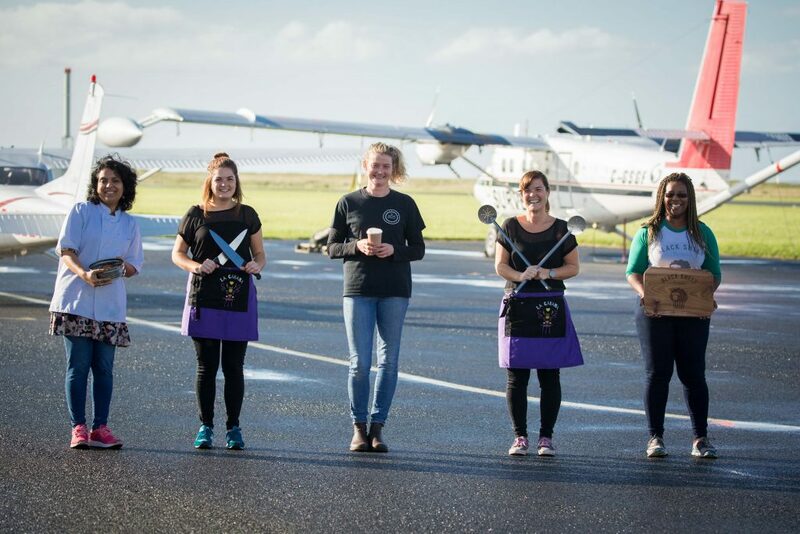 The airport, situated in the coastal surfing village of Strandhill, is to host the inaugural Strandhill Food Festival, turning its facilities including baggage reclaim, departure gates and airport bar into unusual venues for cookery demos, food and drink tastings and live music acts. The idea for the Strandhill Food Festival in the Airport is the brainchild of local man Allan Mullrooney, who for three years has hosted a Sunday Strandhill Peoples Market in the airport’s Hangar 1. Commercial flights once operated between Sligo and Dublin, Manchester and Luton. Ryanair, Aer Lingus and Aer Arran all operated different routes before Government subsidies were withdrawn. The last passenger flight departed in July 2011. But aviation activity has continued and with planes and helicopters taking off and landing just metres away, the Sunday market has become a must-visit for tourists and locals alike. Now the organisers are hoping the Strandhill Food Festival will become a hot new annual destination. Strandhill Food Festival organiser Allan says: “We’ve invited the best foodies, chefs and producers to County Sligo for one day to educate your plates, share delicious recipes and discuss the latest trends, challenges and opportunities in food. There will be live music and family fun events throughout the day. “Just over three and a half years ago, we were searching for a more permanent home for the weekly market. The beachfront area which they had operated at for 4 months had proven to be the best place in the world on a sunny day, and the worst place on the windy stormy days that we’re used to along the west coast! “Once we set their eyes on Hangar 1 at Sligo Airport, we knew this new base would offer an opportunity to grow and progress. On October 7, award-winning Sligo brewery The White Hag alongside The Draft House Gastropub will bring some of Ireland’s finest craft beers and gin’s back into the airport bar – the perfect room with a brew. 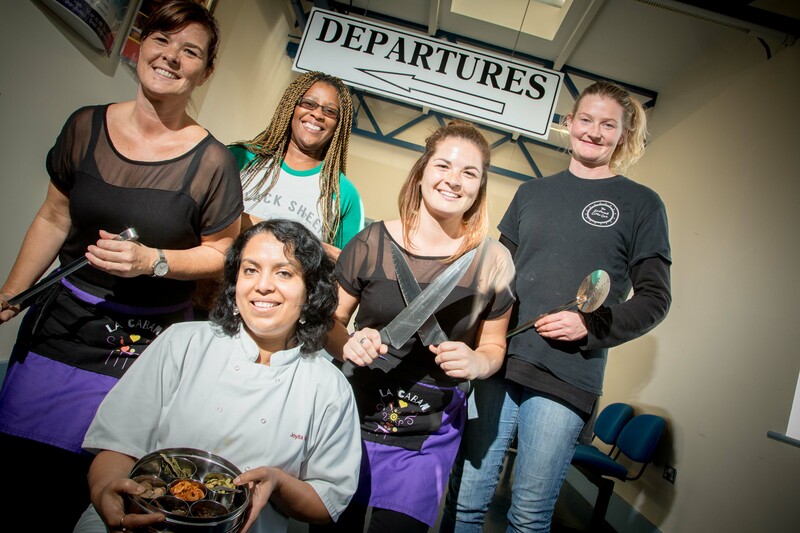 The arrivals hall where customers once waited for their flight to be called and said farewell to loved ones will now be used to house a full day of food demo’s, interactive talks and discussions on food. The departures lounge where anxious passengers waited to board their flight will now house a children’s entertainment area with puppet shows, clowns, and storytelling though illustration and other workshops. Hangar 1 which is usually the home to Strandhill People’s Market, will host the music stage, another craft bar and over 20 food stalls from the across the country. The event runs from 12-8pm with live music all day, kid’s entertainment, food demo’s and more. Kids go free and adults cost €5. Tickets can be purchased at www.strandhillfoodfestival.com or on the door on the day.